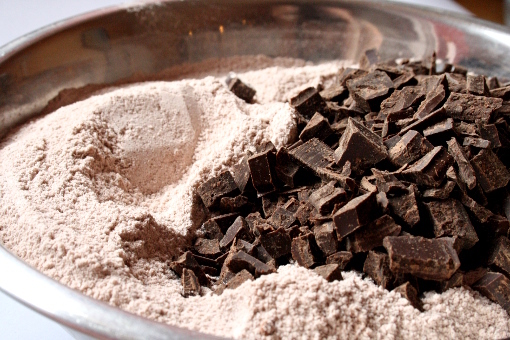 Today I have prepared something lovely for all you chocoholics out there! You surely can’t escape this. … they just make you close your eyes and go “Mmmmmm…”. By the way, did you know that the word “muffin” comes from the French word moufflet which is often times applied to bread and means soft? And did you know that three states in the United States of America have adopted official muffins? Minnesota has adopted the Blueberry Muffin, Massachusetts fell in love with the Corn Muffin and New York took on the Apple Muffin as its official muffin of choice. Today I am officially pronouncing the Chocolate Chunk Muffin my official muffin of choice! 1. Preheat an oven to 356 F (180 C). 2. 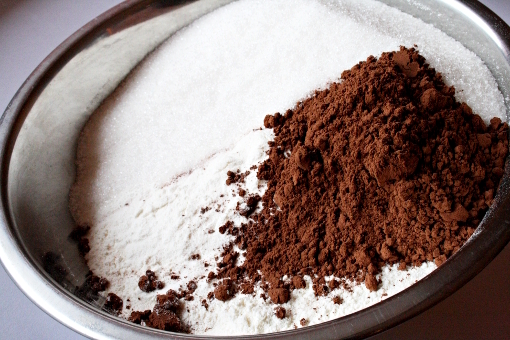 Sift the flour, cocoa, baking powder and sugar into a large bowl. 3. 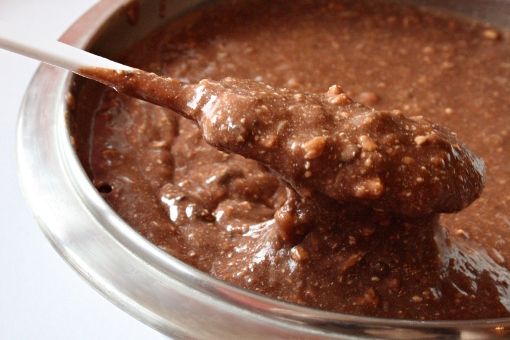 Add the chocolate chunks and stir again. 4. 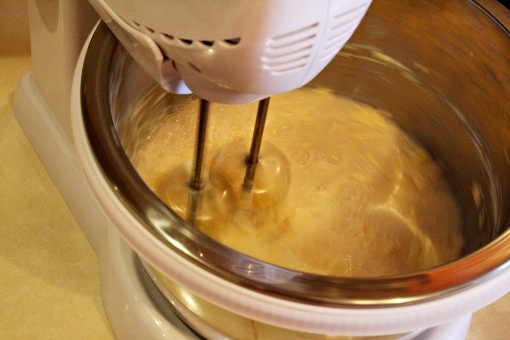 Whisk the eggs, butter and milk. 5. Then, using a spatula or wooden spoon, stir the two mixtures together until everything is moistened. Yes, there will be lumps but small lumps are fine. 7. … and bake for 20-25 minutes. Leave in the pan for 5 minutes before removing. Muffins are best when freshly made, but for muffins anytime you want them, wrap them (cooled) in plastic and freeze for up to two months. Thaw, still wrapped, at room temperature. This lovely recipe was adapted from here. Oh wow!! Those muffins are gorgeous, what a wonderful top shape! Those look fantastic! Where did you get your muffin papers? Yaaay, you like them… . I love them too! I actually found them in Hungary during our vacation there, in one big big supermarket called Cora. Oh YUM those look incredible!!! I spent ages yesterday looking for a good muffin recipe then today found yours. Am going to try it later, they look yummy. Also like the fact that you give metric measurements, thank you! These muffins look fabulous. I love your pictures…they do make me crave your chocolate muffins. I didn’t know all of those things either! Love the papers! These look sooo good! Oh yum! These remind me of these awesome muffins I had in Washington DC- I will have to try these! wow yum! doesn’t look super hard either. found you from tastespotting. gonna try it out. 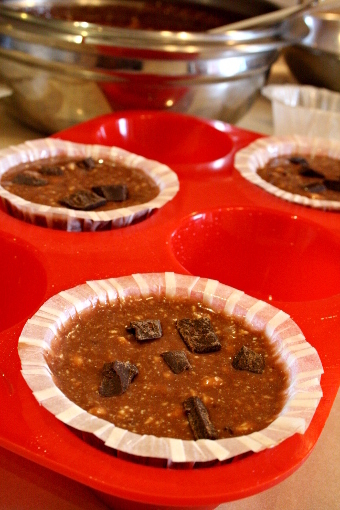 your muffin pan is really cute too!! Ah, those look incredible. And I must echo previous sentiments; I love the cupcake liners! I made these muffins twice. I can tell you that each time i have been showered with compliments.. thanks a lot for sharing. I just love this recipe. Simple and quick to make. These look amazing! I want to try this recipe out with my new jumbo size muffin tin. What kind of liners did you use? Hi! Happy baking to you! I bought the liners very long ago, don’t even remember the name. I bought them in Hungary in a shop called Cora. I can’t take my eyes out of your muffins…look so great. 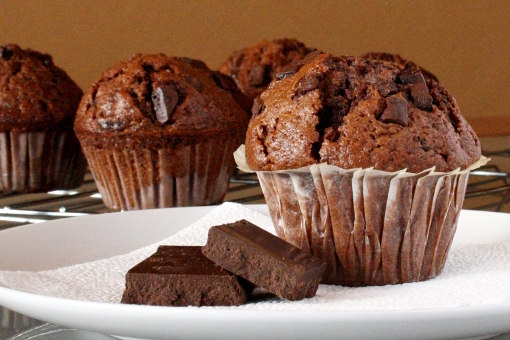 These muffins show promise of satisfying my Chocolate craving. Woooow! Look at those mountain tops!! These looks DELICIOUS! Can’t wait to try them out 🙂 Thanks for sharing! 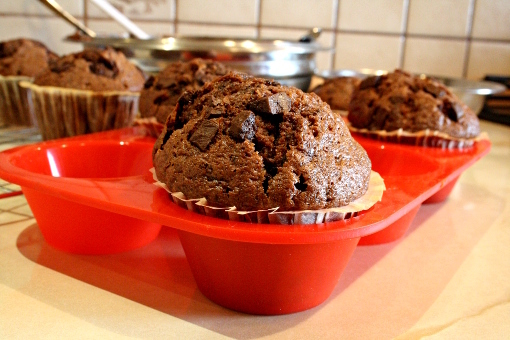 Hi there…first time here…..yummmy looking muffins…thanks for sharing. does the mixture come out smooth when mixing butter egg and milk??? I am your newest fan. I have always wanted a good choc muffin recipe. Can’t wait to try it out. Super photos and love your elegant simplicity. Your muffins looked so good!! But may I ask would the chocolate chunks be a bit bitter as it is dark chocolate? If I change it into milk or semi-sweet kind, will it be too sweet? Hellooo!! Beautiful recipe and Muffins!! How many muffins does this recipe makes? Congrats by the way, everything looks super yummy! I tried your recipe and it was yummy! But mine doesn’t look as pretty as yours. Just wondering if I did something wrong? How did you get yours to rise like that? I put in the 1 1/2 cups (360 ml) milk, but I had to add more because I couldn’t mix in all the flour. I added something like 3 extra splashes of milk. Also what type of sugar did you use? I tried raw sugar. I also brushed the pan with melted butter. If was going to make it again I would use slightly less chocolate chunks, and mix the butter with the eggs before adding the milk so the milk doesn’t splash everywhere. This recipe also makes 46 miny muffins. (I used about a desert spoon for each) and cooked for approx 15-20 min.